Durability: Porcelain flooring is very durable and the tiles are difficult to crack. A quality installation can last for 10 to 20 years and even longer if well maintained. Water Resistant: Glazed ceramic and porcelain tiles have a non porous layer of liquid glass that sits on top of the tiles making them impervious to water and stain penetration. They are also naturally resistant to the ravages of high humidity conditions. These properties makes them ideal for use in wet environments like bathrooms and kitchens. Maintenance: Tile is easy to care for. 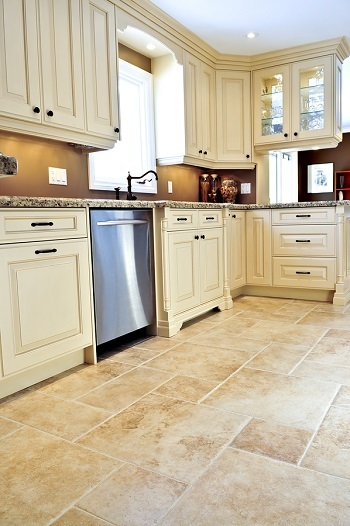 Dirt and stains rest on the tile surface making then easy to clean. Maintenance consists of wiping, sweeping or vacuuming with a soft brush attachment to keep the tile free of dust and dirt. If a stain does occur use a non toxic cleaner and rub it until its removed. Color Options: Porcelain tiles allow for a wider range of styles and colors. Modern manufacturing allows tiles producers to make materials which can be printed in all types of ways. Tile can be printed to reproduce the look of a number of hardwoods and stones.